Mackley completed the largest managed alignment of the open coast in Europe and the first in the UK. 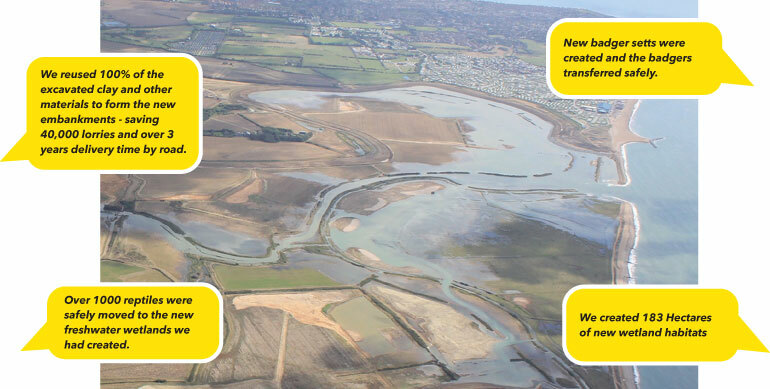 Managed realignment involves building new defences inland from the coast and allowing a new intertidal area to form seaward of the new defences. We reused 100% of the excavated clay and other materials to form the new embankments - saving 40,000 lorries and over 3 years delivery time by road. We avoided importing new and part established plants by translocating the existing reeds. Over 1,000 reptiles were safely moved to the new freshwater wetlands we had created. Evidence of the success of the scheme can be seen in the video of over 50 Starry Smooth-hound Sharks in the inlet channel. Some water vole were trapped and overwintered in a special facility before being transferred to the new habitat. Others were moved within the site through habitat manipulation. New badger setts were created and the badgers transferred safely. We incorporated ecological mitigation for birds by planning our construction alongside farming practices – we made sure there were suitable habitats on site at all times. We built eight large concrete flood control/water conveyance structures into the embankments with integrated flap valves to prevent saline ingress into the freshwater ecosystems inland.